I've recorded the most of the material here solo, overdubbing quite a lot in "Johnny B. Goode" and "Blue Moon Of Kentucky". Couldn't help it, it was fun, and most people liked it. Pera Joe, mouth harmonica on the bonus track "Today Today Blues"
Petra Kvist, fiddle on "Blue Moon…", Frida Möller, background vocals on "Johhny B. ", Szabolcs Nagy, piano on "Johnny B." Arne Malteus (drums), Mats Helmer (gtr), Michael Nilsson (bass) on the other bonus track "Sweet Home Chicago"
Blues Trio live (as almost all our recordings have been over the 30 years of existence) between 1995 - 2005. 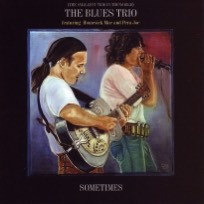 This CD is a compilation of previously unreleased live material - recordings made during the Blues Trio's 20+ years (here between 1993-2004). Everything was recorded in Serbia and we threw in some nice folk - influenced stuff as well. The instrumental "Ima Dana" (Sometimes) was improvised on a gig, and we've even played a piece of a real Serbian "Kolo" (dance) right in the middle of a medley of "Down By The Riverside/When The Saints Go Marching In". "Can't Hold Out" is far from Homesick Mac being an acoustic player, we were both amplified there just as much as we could be. "Down By The Riverside/When The Saints Go Marching In"